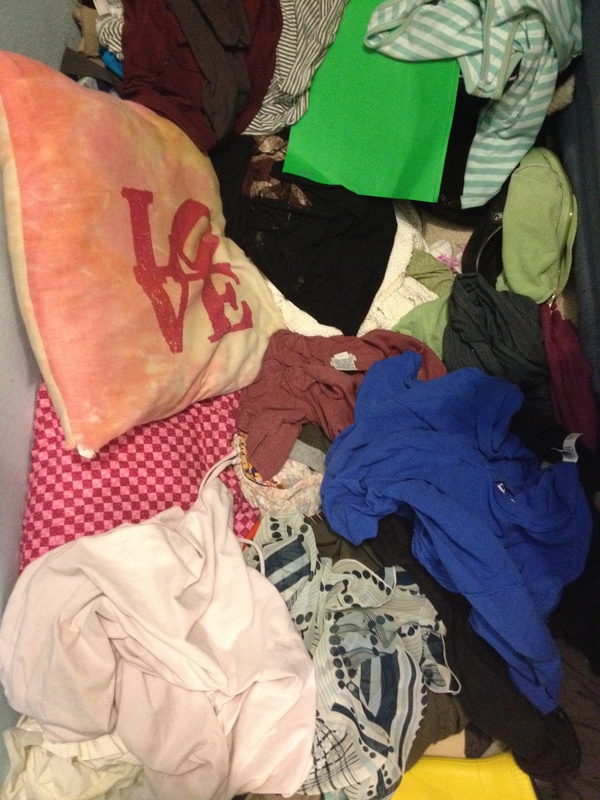 This is the bottom of Hazel’s closet. It makes me want to cry. Saturday morning I got up at 6:00 am to clean the house. This isn’t a typical Saturday morning for me. I like to wake without an alarm, have a leisurely yoga practice, hang with the girls, maybe even read a little. But on this Saturday I was expecting a visit from my out of town friend at 9:00am and then my in laws would arrive 12:00 for the weekend. I wanted to be ready. 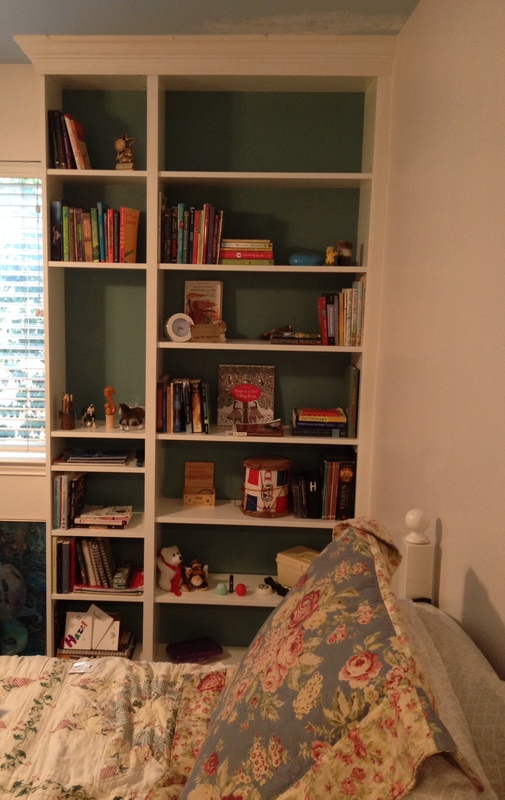 It had been so long since my house was clean and orderly (See Operation Bookshelf 2015) and there was a lot to do. The alarm sounded at six and after a perfunctory version of my morning personal hygiene routine, I began to whirl around the house in my pajamas putting/throwing stuff away, wiping surfaces, washing dishes, and spraying mirrors. I amassed piles and piles of laundry and an embarrassingly large pile of dirt swept from the floors. Five minutes into mopping, I broke out in a sweat that didn’t let up until I got into the shower, 5 minutes before my friend arrived. It was worth it. The house looked great! I was so pleased that I decided I’d make a real effort to keep up with the house this week and remind the girls to do their chores. I’ve always noticed that my future looks a little brighter when the house is clean. I had a great visit with my friend and shortly after, my kids and in laws arrived. We shared a meal (dishes). We went in and out of the doors a few times (dirt, luggage and stuff). That was all it took and in a quiet moment I looked around and my heart cried a little. The house didn’t look clean anymore. I knew I could whirl around cleaning up after everyone all weekend or I could spend time enjoying the visit. The choice was clear. I remember looking at the clock at this moment… the moment of defeat. It was 12:15pm. Śauca (sh-ouw-cha), cleanliness, is the first of the five niyamas, or guidelines for ethical living, laid out in the Yoga Sutras. There are many ways that we practice śauca. We maintain a clean body, living space and environment. We eat “clean” food that we can digest and eliminate well. We do our best to maintain a cleanliness of thoughts. All of this seems reasonable and worthy of aspiring to, but it wasn’t until hearing my teacher, Chase Bossart, talk about śauca that I came to appreciate the deeper teachings of this practice. When we make an effort to keep our body clean, we start to understand what parts of our self is constantly in need of maintenance and care and the part, the Self, that is always clean. When we do what we can to maintain what we have, (house, car, stuff, environment), we can see that having stuff takes energy, resources and time. There’s a cost to having and maintaining the many things in one’s life. Eliminating what isn’t needed can open up time. Time that we can spend getting to know or in relationship with the aspect of our self that is unchanging and always clean. Time spent connecting to visitors and loved ones. Time on what really matters. Update: “The weekend project that still isn’t completed” is complete!!!!! IKEA Billy bookshelf hack was a (hard-earned) success. Here’s a pic of the right half. There’s another set to the left of the window with enough shelves to hold all of Hazel’s books and knick knacks. yay! There’s a cost to having and maintaining the many things in one’s life. The shedding of unnecessary stuff is an ongoing part of keeping my house running smoothly, and as soon as I read your line about the guilt of what you aren’t maintaining, it was an a-ha for me too. There’s a weight (burden?) that comes with all the things to do in the yard, the house, the cars, the stuff and it does feel like guilt. hmmmm. we’ll both keep at it. Less time maintaining, more time for what really matters. Patanjali says something like that in his sutras.